The US government says North Korea seems to be moving towards testing a long-range missile, which could have the range to reach US territory. But the Pentagon refused to confirm or deny reports that it had activated its missile defence system in response. The US ambassador to Japan hinted that the missile could be shot down. Amid growing pressure on Pyongyang, former South Korean President Kim Dae-jung cancelled a planned trip to the North Korean capital. The North has asserted its right to conduct missile tests, and said it was no longer bound by a 1999 moratorium or a 2002 agreement with Japan. But it is also reportedly calling for talks with Washington to resolve the issue, which analysts said suggested North Korea was trying to use the row for wider, diplomatic purposes. George Bush's national security adviser Stephen Hadley said on Tuesday that North Korea appeared to be moving towards a missile launch, although "the intelligence is not conclusive at this point". 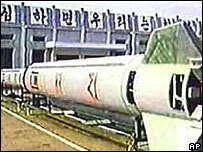 He said it was "hard to tell" whether the country had finished fuelling a Taepodong-2, a missile thought capable of reaching US territory. "There tends to be a desire to create a sense of crisis," he said. The comments came after unnamed US officials had been quoted as saying that America's missile defence system had now been activated. But the Pentagon says it does not comment on the status of the system. The White House has refused to say what action the US might take if the missile is launched. The US ambassador to Japan, Thomas Schieffer, said on Wednesday that the US had a greater capacity to track missiles than in 1998, when North Korea last launched a long-range missile. Asked if the US would shoot down a missile, he said: "We have options that we have not had in the past, and all these options are on the table". The BBC's Jonathan Beale in Washington says shooting a missile down would be only likely to escalate tensions. Japan, Australia, China and South Korea have repeatedly called on North Korea to abandon any launch plans. 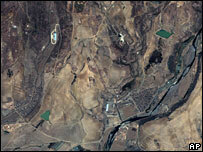 South Korea warned that thousands of tons of food aid would be at risk if the launch went ahead. This is a case of North Korea's typical brinksmanship foreign policy. Officials in Seoul announced that the former South Korean President Kim Dae-jung had cancelled a visit to Pyongyang planned for next week. The trip was now "practically impossible" because of "the unexpected circumstances", an official said. Mr Kim has played a key role in past talks with North Korea, and had hoped to use the meeting to help restart stalled six-country talks on ending Pyongyang's nuclear programmes. North Korea has not said it plans to go ahead with a missile launch, but diplomats have asserted the country's right to develop and test missiles in recent media interviews. Han Song-ryol, deputy chief of North Korea's mission to the United Nations, told South Korea's Yonhap news agency that the country would like to ease tensions over the situation through talks. 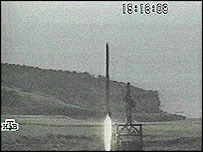 North Korea last tested a long-range missile in 1998 when it fired a Taepodong-1, with a range of 2,000km (1,200 miles), over northern Japan. North Korea has observed a self-imposed moratorium since 1999, but Han Song-ryol said that this only applied when the country was in dialogue with the US. The US says North Korea also implicitly agreed not to test-launch any new missiles at multi-party talks on its nuclear programme last year. But the six-party talks have been stalled for months. Correspondents say North Korea may be now using the missile threat to try to break the deadlock, or as a bargaining chip in negotiations.